At the advice of her therapist, homicide survivor Harper Reynolds has traded her job as a crime scene photographer for a more peaceful life taking photographs of the natural world. But her hopes for a life surrounded by the serenity of the outdoors are dashed when she inadvertently captures a murder being committed in Jackson Hole, Wyoming. She flees the scene in fear--and loses the camera. Former Green Beret Heath McKade is a reserve deputy in an understaffed county who has been called in to protect Harper, a childhood friend he is surprised to see back in the area. When Harper learns that the sheriff's department can't find any evidence of the murder she witnessed, she is determined to do what she can to see that justice is done. What neither Harper nor Heath could know is how many explosive secrets from the past will be exposed--or how deeply they will fall for each other. In this suspenseful page-turner, bestselling author Elizabeth Goddard keeps you on the edge of your seat as you discover that uncommon justice lies just on the other side of fear. Elizabeth Goddard is the bestselling author of more than 30 books, including Never Let Go and the Carol Award-winning The Camera Never Lies. Her Mountain Cove series books have been finalists in the Daphne du Maurier Awards and the Carol Awards. Goddard is a seventh-generation Texan and can be found online at www.elizabethgoddard.com. 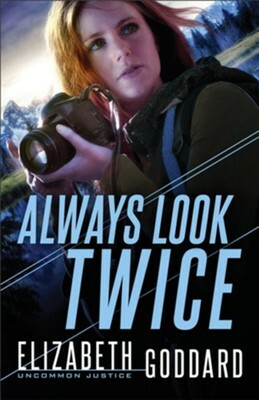 I'm the author/artist and I want to review Always Look Twice (Uncommon Justice Book #2) - eBook.